Interior doors have important jobs. They provide sound insulation, privacy and character to your home. While solid wood or natural wood-veneered doors can be more expensive than synthetic alternatives, they look great and have the broadest range of finish choices. As with any solid wood product, be sure you finish all the edges of a wood door to keep moisture from damaging it. If you know you’ll be painting the door, you can save some money with MDF, or medium density fiberboard. Paint-grade MDF doors provide a smooth surface for painting and won’t warp, crack or split. 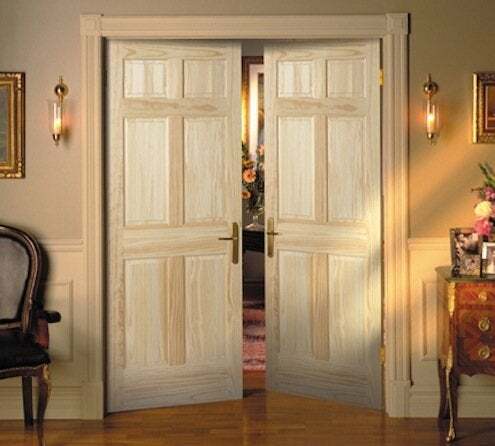 Like solid wood doors, they come in a variety of panel configurations to match your home’s historic period. For new construction with standard-size door openings, it’s easiest to buy pre-hung doors. If you’re replacing a door in an existing frame, you can purchase just the door slab and install the hinges on site.